The first offering in the line-up was the CTS-V, appropriate enough considering the base sedan ushered in Caddy’s edgy Art & Science styling theme, setting in motion one of the most significant, design-driven turnarounds in domestic automotive history. Now, the luxury maker is readying two more V-Series offerings, the XLR-V, which we reviewed a few weeks back, and the STS-V, the 469-horsepower spin-off of Cadillac’s flagship sedan. That’s a neck-snapping leap from the standard V-8 model’s 320-hp Northstar engine, and as with anything Caddy will designate with the flying-V badge, that means 0-60 times comfortably under the five-second mark. Fast may be fun, but when you’re spending this kind of money, you’re looking for a lot more than just muscle. A truly world-class luxury sports sedan needs to deliver a blend of acceleration, handling, and, of course, all the high-line accoutrements one would get from competitors like the Mercedes-Benz E55 AMG. With its knife-sharp lines, the CTS remains a traffic-stopper, even three years after its debut. In today’s crowded market, that’s no easy feat. The STS doesn’t have quite the visual arrest. It’s a little more refined, in a sanded-down way. Oh, it’s handsome enough, but without the raw power. In V-trim, things look a little better, the big sedan getting a menacingly refined stainless steel mesh grill and mesh lower air intake. There are new, ten-spoke aluminum wheels and modest, lower aero treatment. Inside, the sedan gets a gauge cluster that’s distinctive and unique to the STS-V. There’s also a new wood trim package that would help distinguish the interior overall were it not for the massive center electronics cluster. The climate control, audio, and navigation system are collectively clad in the sort of ungrained, gray plastic that normally distinguish discount-store gear. Think of it as trying to put a museum frame around a velvet Elvis. That’s too bad, because the rest of the interior pushes world-class. The French-stitched leather seating, in particular, is lavishly upholstered and incredibly comfortable. It’s also got the sort of bolstering you’ll need as you push a car like the STS-V the way it should be driven. Slip behind the wheel and press the Start button. You’re greeted with a deeply resonant roar and just a modest dose of blower whine. We were pleased to see Caddy engineers put so much effort into sound control. There’s nothing like the rumble of a big V-8 under full load, though we’ve never warmed to the whirring of supercharger gears. It took more than just a Roots-style supercharger to pump out another 149 horsepower and 124 pound-feet of torque from Caddy’s Northstar V-8. Engineers actually reduced the bore on the engine block, displacement cut from 4.6 to 4.4 liters, in order to ensure the necessary rigidity and reliability. They modified the connecting rods, introduced new cylinder heads and heavy-duty pistons, and came up with an intriguing solution for intercooling the blower’s charge. That alone added a lot to power. You feel it the moment you tap the accelerator. The electronically controlled throttle is faithfully responsive and despite the sedan’s 4295 pounds, you’re running extra-legal speeds before you can glance down at the gauges. No, you’re not going to blow away an M5, but you’ll give an E55 a reasonable run for the money, despite its extra torque. During a couple days running around city and countryside near San Diego, we had a chance to not only push the STS-V to its max, but also to see how it compared with a CTS-V. The comparison was startling. The smaller four-door is about as fast and we have to love its Corvette-derived manual (while lamenting the lack of stick in the STS-V). But one thing we realized was just how skittish the CTS-V feels in comparison. It feels like you’re riding on skates as you push things hard. The bigger sedan, on the other hand, remains fully planted, no matter how rough the road, no matter how demanding your right foot. Cadillac’s impressive MagneRide obviously gets a lot of credit. The system is the fastest electronic suspension on the road. But other steps enhance handling on GM’s Sigma platform, which is shared by both sedans. There are larger anti-roll bars, for one thing, stiffer springs and other suspension components. Steering is still a little lighter than some of Caddy’s European competitors, but it’s markedly more precise than the CTS-V, and less likely to cause fatigue after a few hours of driving. Along with the basic Sigma “architecture,” CTS-V and STS-V share four-caliper, 14.0-inch front and 14.3-inch rear Brembo brakes. The car’s non-linear brake feel could use a little improvement, however. At $77,000, the V doesn’t come cheap, though it’s a relative bargain compared to the likes of the E55. And it comes standard with a fairly hefty list of standard gear, including navigation, keyless start, and a highline Bose audio system. It’s too bad Caddy couldn’t have done a little more to fix the overall modest issues with the STS-V, though we’re expecting a sizable interior re-make within a couple of years, according to our corporate sources. Even then, the STS-V is a solid and credible entry that will further underscore the seriousness of GM’s bid to rebuild this once-dominant brand. The STS-V doesn’t win a hands-down shootout, but it holds its own proudly. This machine will help redefine the concept of American muscle. Fuel economy (EPA city/hwy): 14/21 mpg est. 2006 Cadillac STS-V "The Sleeper"
The STS-V is a "Rocket-Ship" in disquise! Supercharged 469 HP V-8 is earth pounding! This Car can go 0-60 in 4.2 seconds! You should see the looks on driver's faces in Corvette's, Camaros, Dodge R/T... The STS-V is a "Rocket-Ship" in disquise! Supercharged 469 HP V-8 is earth pounding! This Car can go 0-60 in 4.2 seconds! You should see the looks on driver's faces in Corvette's, Camaros, Dodge R/T Challenger's as this "Sleeper" Superchararged Cadillac leaves them in the dust as we line up on stoplights that lead to a dual lane race course! Luxury is everywhere, Burl Wood on Dash and Door Panels, Leather with suede inserts in all seats, keep you from sliding sideways off of your seat as the "G" Forces rises! Michelin Pilot Run Flats keep this Cadillac firmly on the road! 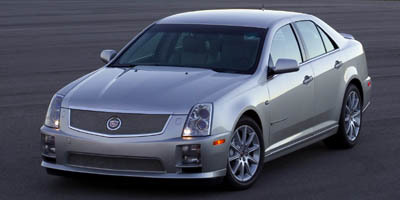 Looking for a different year of the Cadillac STS-V?